The Honors College is proud to announce Tooba Hussain as our Honors Student of the Month for February 2017. Tooba is a junior Political Science major with minors in Journalism and Business Management. 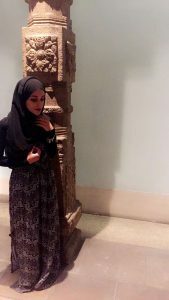 She is also a student leader with roles in the Political Science Society, Honors College Think Tank, Muslim Student Association, and Student Government Association. TH: Never let circumstances become excuses. Make the best of every situation and put your all into everything you do. TH: Leaving high school, I wasn’t sure I wanted to be a commuter or attend a smaller school, but in retrospect I think coming to Rutgers is the best choice I could have made. People think that the college experience will come to you, but at Rutgers Camden I’ve learned that the college experience is something you create and shape for yourself. HC: Tell us more about the college experience you’ve shaped for yourself. How has being involved on campus defined that experience? TH: My campus engagements have definitely thrown me into situations I did not expect, and as a result, they forced me to become a leader. I’m naturally kind of soft spoken, so I thought I would never be a “leader” because I just assumed that you had to be a certain type of person, maybe a more extroverted person, to be comfortable in leadership roles. But now I see that I’ve developed real leadership skills at Rutgers, and I think I have my campus involvements to thank for that. TH: I performed spoken word poetry in front of over 100 people at a Muslim Student Association event. Leading up to the event I was terrified. I had always kept my poetry to myself before then, but somehow I got up the nerve to perform and the audience loved it! I never thought I could elicit this kind of reaction, but when I realized that my words could impact other people, that was a really powerful moment. TH: I hope to attend law school and eventually become a human rights advocate working with an NGO. The way I see it, so many people have poured so much into helping me, it would be a waste if I didn’t use my success to give back and help shape other people’s lives for the better. Page last updated by The Honors College at 1:43 pm March 2, 2017 . This page was printed from http://honors.camden.rutgers.edu/hc-student-of-the-month-archives/february-2017/ at 8:28 AM Wednesday, April 24, 2019.